Estate planning isn’t just about what happens to your assets after you die. It’s also about protecting yourself and your loved ones. This includes having a plan for making critical medical decisions in the event you’re unable to make them yourself. And, as with other aspects of your estate plan, the time to act is now, while you’re healthy. If an illness or injury renders you unconscious or otherwise incapacitated, it will be too late. Without a plan that expresses your wishes, your family may have to make medical decisions on your behalf or petition a court for a conservatorship. Either way, there’s no guarantee that these decisions will be made the way you would want, or by the person you would choose. To ensure that your wishes are carried out, and that your family is spared the burden of guessing — or arguing over — what you would decide, put those wishes in writing. Generally, that means executing two documents: 1) a living will and 2) a health care power of attorney (HCPA). Regardless of terminology, these documents serve two purposes: 1) to guide health care providers in the event you become terminally ill or permanently unconscious, and 2) to appoint someone you trust to make medical decisions on your behalf. A living will expresses your preferences for the use of life-sustaining medical procedures, such as artificial feeding and breathing, surgery, invasive diagnostic tests, and pain medication. It also specifies the situations in which these procedures should be used or withheld. An HCPA authorizes a surrogate — your spouse, child or another trusted representative — to make medical decisions or consent to medical treatment on your behalf when you’re unable to do so. It’s broader than a living will, which generally is limited to end-of-life situations, although there may be some overlap. 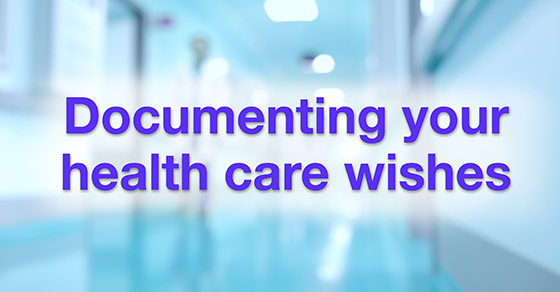 No matter how carefully you plan, living wills and HCPAs are effective only if your documents are readily accessible and health care providers honor them. Contact us with questions.